This dish is so festive-looking it can be made for a special occasion or as a last-minute, quickie dinner. It’s important to remember that the shrimp cooks very quickly, easily becoming chewy and overcooked. But if you stay on top of the process, you’ll have succulent shrimp every time. Prep the shrimp: In a medium bowl, place the garlic, olive oil, ¼ teaspoon salt, and pepper to taste. Add the shrimp, toss to coat, and marinate for 15 minutes or more. Make the salad: In a medium bowl, combine the mâche, avocado, fennel, and red onion. Drizzle with the olive oil, balsamic vinegar, and lemon juice, and sprinkle with salt. Toss and arrange on two plates. Make the shrimp: Preheat the grill to medium-high. Thread 5 shrimp onto each of 2 skewers. Brush with the marinade. Grill for 2 to 3 minutes per side, or until just cooked through. 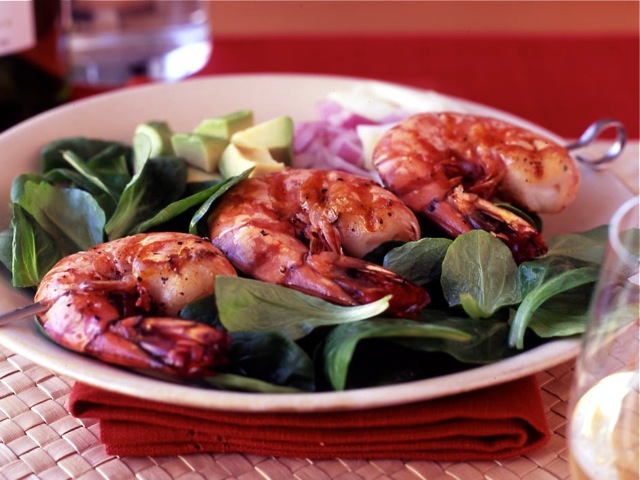 Place the cooked shrimp on top of the salad, and serve.